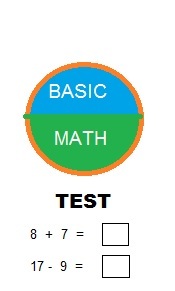 In this topic basic math test we have given some of the basic ideas to face some simple problems in math.The page is containing the number of worksheets which is based on the basic things of math.This should be very useful for kids who is trying to learn math from the beginning.Every one should know these basic topics in math.Here we have also given shortcut ideas.In this first topic how to add two numbers we have given addition table.Many of the students may face the common problem for adding two number with different signs different.Not only basic level addition we have also added fraction worksheets and factoring.We have provided clear ideas,examples and exercise also. Also we have provided worksheets for each topic given below.This topics are particularly prepared for beginners and students.We have also given real life examples.In the second topic you can find multiplication table and techniques for multiplying two numbers with different signs. Order of operation plays a major role in mathematics.The fourth topic Divisibility test will be more useful for simplifying two numbers using same table.Fifth topic is containing how to factories a quadratic equation.We have also given example questions and worksheets for all the topic. Like wise we have added lots of topic for learning basic techniques in math.This will help you understand clearly about the topics in math.This is will increase your confidence level in solving these kinds of problems.Other than this we have also given lots of math worksheets.This will be most useful to the students who are trying to learn basic things..These pages will be very useful to school students. Students can do the problems given in the above links on their own, and verify the solutions. If you are having any doubt you can contact us through mail, we will help you to clear your doubts. How to get 1000 using only eight '8's . We can use only addition for this. Write the three digit numbers, so that the second digit is two times the first digit, and the third digit is half of the second digit. 121, 242, 363 and 484. There are three numbers. We will get the same answer if we multiply them or add them. Can you guess the numbers?